A round top (m 2277) over Brunico, enjoying a very wide panorama. 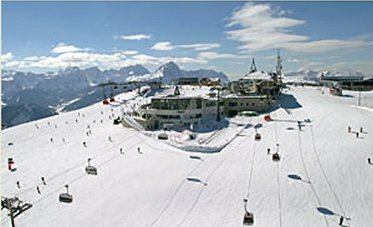 Once presumably the site of a Brandopferplatz no trace of which can however be found today, Plan de Corones is nowadays a devastated haut-lieu of mass skiing. On the Plan de Corones, Dolasilla is crowned with her Raietta by her father. We dont'know whether the mountain is called de Corones ("of the Crowns") in memory of that mythical ceremony, o whether the ceremony has been located there according to a name that could have nobody knows what different origin. 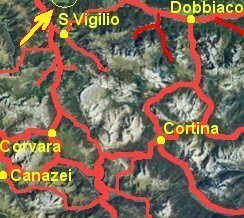 The pairing makes us suppose, however, that the first campaigns to which Dolasilla took part were targeted at the rich villages of the Pusteria valley. Only later on, the Fanes will turn South, with tragic results. Excursions: it can be easily reached by any type of lift from all directions; on feet, with an easy walk (1 1/2 hs.) from the Furcia pass (m 1737).